Mr. Erdogan’s supporters at a rally in Istanbul on Friday. When President Recep Tayyip Erdogan called early elections two months ago, he seemed assured of victory. But as Sunday’s vote approaches, the man who has transformed Turkey over 15 years in power appears increasingly vulnerable. The question will be, just how vulnerable is he? The vote will be watched far beyond Turkey’s borders for what it will decide about the direction this country of 80 million — whether it continues down the path of populist authoritarianism with Mr. Erdogan, or takes a turn for democratic change. A skillful politician with a fervent support base, Mr. Erdogan still leads in the polls. But dissatisfaction over a sudden downturn in the economy is spreading. So is alarm over Mr. Erdogan’s increasing authoritarianism, which, if he wins, will be given even freer rein under a newly strengthened presidency. 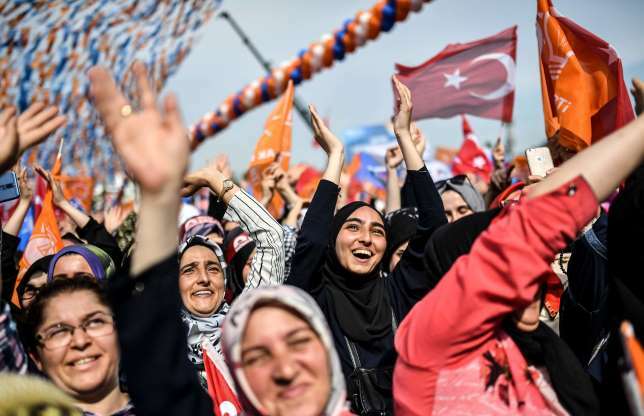 Whether Mr. Erdogan can secure the outright victory he wants by gaining 50 percent of the vote — avoiding a runoff — may depend on how deeply the wariness and unhappiness with his rule have unsettled his core supporters. In particular, the collapse of agriculture, a plunge in the value of the lira and a sudden rise in food prices may deliver Mr. Erdogan a shock at the polls, opposition party workers say. Much of the president’s base of support has been among conservative rural people. “I am hesitant this time,” said Bulut, who sells fresh juice from a cart near Istanbul’s ferry docks. He gave only his first name for fear of repercussions. He said he had voted for the governing party over the past 16 years but complained angrily about the deteriorating economy. If 7 to 8 percent of formerly loyal voters abandon the president’s Justice and Development Party, or A.K.P., the governing party will lose, said Ozer Sencar, who runs the independent Metropoll polling agency. There are already signs of defections, Mr. Sencar said, noting that some of them had voted against Mr. Erdogan in last year’s referendum to expand the powers of the presidency, which passed only narrowly. “This is the group that will determine the fate of the election,” he said. Most of the group are conservative Islamists among the Kurds who are disappointed that Mr. Erdogan failed to keep his promise to make peace with Kurdish separatists, Mr. Sencar said. Four opposition parties — the Republican People’s Party, the Good Party, the Felicity Party and the tiny Peoples’ Democratic Party — have formed an alliance to maximize their assault against Mr. Erdogan. But the state of emergency Mr. Erdogan snapped in place almost two years ago after a failed coup has allowed the government to tilt the playing field greatly in its favor. Mr. Erdogan has used the extra powers to jail political opponents, including nine Kurdish members of Parliament and dozens of Kurdish party officials, as well as 70,000 students and activists and tens of thousands of members of the military and public employees. Demonstrations are banned, and access to national television is tightly controlled. The Kurdish candidate, Selahattin Demirtas, has campaigned from prison, where he is being held while he awaits trial on terrorism charges. He relies on a team of lawyers to relay his messages on social media. And last week he was permitted to record a single campaign speech inside prison that was aired on the state-run Turkish Radio and Television, or T.R.T. A former interior minister, Meral Aksener, is barred from using large rally sites and has barely been seen on television — most of which is controlled by the government or its allies. Muharrem Ince, the closest challenger to Mr. Erdogan, fares slightly better, appearing on some television channels but still barred from T.R.T. Over the past six weeks, Mr. Erdogan has enjoyed 181 hours of national television airtime, while Mr. Ince was allowed 15 hours, Ms. Aksener three hours and the rest one hour or less, according to the Supreme Board of Radio and Television. It is Mr. Ince who has been Mr. Erdogan’s main target, smeared by “fake news” campaigns by government supporters. But he has parried the attacks with humor and a hopeful message and has started drawing crowds to match those of Mr. Erdogan. Yet there is no doubt that Mr. Erdogan’s persona has dominated the campaign. His campaign posters are the largest and most numerous. His rallies are broadcast live on virtually every television channel. And his voice is heard everywhere. He also controls all the levers of power, rules by decree under a state of emergency and can count on a tame judiciary and presidential guard. Government employees are ordered to attend Mr. Erdogan’s rallies — and give him their vote if they value their jobs — opposition campaigners say — and journalists in media outlets, which are mostly owned by allies of the president, are given guidelines on what to write. But signs of disaffection are visible. Supporters declare their love for Mr. Erdogan, yet many start leaving his rallies halfway through his long-winded speeches. The former Islamist allies who have turned against the president are the most outspoken. Temel Karamollaoglu, leader of the small Felicity Party, criticizes Mr. Erdogan for betraying his religion by letting corruption and injustice invade his government. He is set to draw away 2 to 3 percent of Mr. Erdogan’s conservative religious following. The Republican People’s Party, which has a long tradition of secularism, has added several Islamists to its party list to build an Islamist alternative to Mr. Erdogan’s A.K.P. One of the co-founders of the A.K.P. with Mr. Erdogan, a former deputy prime minister, Abdullatif Sener, is running for Parliament on the Republican People’s Party list in the conservative city of Konya. He stunned villagers during meetings in a farming district with strident criticism of Mr. Erdogan, the likes of which is never heard in the mainstream media. “If you cannot buy food and clothes for yourself, it means the economy is not growing,” he told them, disputing government claims of 7 percent growth. He accused Mr. Erdogan of neglecting Turkey’s agriculture to make money on deals importing foodstuffs. A shopkeeper in the village of Cayhan told Mr. Sener that villagers were too scared to tell the truth but that almost all were going to switch their support away from Mr. Erdogan. “Something is going to happen,” said Bulent Ecevit Tatlidil, a member of the executive bureau of the Republican People’s Party who is from the farming district. Outrage over a sudden paucity of onions has even hit the main television news. Ms. Aksener accused Mr. Erdogan of treason for his neglect of agriculture. Yet the opposition is also bracing for every manner of obstruction, including fraud and violence. Mr. Sener’s campaign office in Konya was attacked last week by members of the local youth wing of the A.K.P., who slashed a poster of Mr. Sener and smashed campaign cars. The election observer mission of the Organization for Security and Cooperation in Europe has noted in a preliminary report that the president enjoys favorable conditions, while other parties face obstructions to campaigning and a pervasive atmosphere of fear in the Kurdish areas of the southeast. The opposition parties are fielding 100,000 volunteers to observe voting in every polling station but face multiple challenges as regulations have been changed to allow unstamped ballots to be counted, and some polling stations have been closed and voting moved to other locations. In the southeast, violence has already broken out; an election dispute led to the deaths of three people in the town of Suruc. Some analysts speculated that the clash was about how to fix the vote for Mr. Erdogan. The Kurdish vote, which represents about 10 percent, is particularly important for both sides. If Mr. Demirtas’s People’s Democratic Party, or H.D.P., can pass a 10 percent threshold, it could rob Mr. Erdogan of a majority in Parliament. If the party wins less than 10 percent of the vote, its votes will be distributed to the other parties, which would most likely help Mr. Erdogan secure a majority. In a sign of how crucial the Kurdish vote is, Mr. Erdogan urged party members to make sure the H.D.P. vote remained below 10 percent. In a video posted inadvertently over social media last week, he told a closed gathering of regional party members to watch H.D.P. voters.